Israel - BDS. Flickr/ Takver. Some rights reserved.The relationship between anti-Zionism and antisemitism is a vexed and controversial question. My starting point is to elucidate an understanding of the meaning of Zionism; a term and a political concept which is rarely defined and frequently misunderstood. This is hardly surprising given that today in the 21st century, Zionism/ist is construed as an insult by some and is often equated with apartheid and even worse, Nazism. My understanding of Zionism seeks neither to exonerate, praise nor condemn. Rather we must seek to comprehend the Zionist movement and concomitant ideology in its historical, material and constantly evolving context. Put simply Zionism is a form of nationalism which developed under two sets of linked influences in the last quarter of the nineteenth century and beyond. The first was the European nationalist movements which led to the formation of such nation states as Germany and Italy in the 1870’s and the nationalist inspired impulses in many other countries. The second spur to Zionism was the ubiquitous antisemitism experienced by Jews in most of the countries in which they were domiciled. Such antisemitism was nothing new it had existed for centuries, but the prevalence of state supported nationalist ideologies influencing indigenous populations in the direction of patriotic flag waving fervour (what the late historian E.J.Hobsbawm called ‘the invention of tradition’), led to a renewal of the hatred of the ‘outsider’ (Jews) in a virulent form in the late nineteenth and early twentieth centuries. It was in these linked contexts that a form of Jewish nationalism emerged - Zionism. Later, of course, German Nazism expressed the ultimate form of antisemitism - culminating in the Holocaust in which upwards of six million Jews were murdered in the most brutal and shocking circumstances. It should be noted, however, that antisemitism was not confined to Europe; it emerged later in the Middle East and resulted in the mass expulsion of Jews from such countries as Egypt, Iraq, Lebanon and others in the 1950’s and 1960’s. From the very beginning during the nineteenth century there were many currents within Zionism, although initially Theodore Herzl’s version was the dominant one. Herzl was not the first to propound a form of secular, as opposed to religious, Zionism. This began with the writings of Moses Hess in the 1860’s, an associate of Karl Marx. (Hess was the Paris correspondent of the ‘Rheinische Zeitung’, the paper edited by Marx). Much later Ber Borochov developed a Marxist theory of Zionism as expressed in his book ‘The National Question and the Class Struggle’ (1905). He was one of the founders of Labour Zionism - Poale Zion; an organisation which attracted many Jewish socialists, including David Ben-Gurion, the first Prime Minister of the State of Israel when it was founded in 1948. Borochov and Poale Zion advocated a harmonious relationship between Jew and Arab in Palestine although Borochov himself did not live to see the creation of Israel since he died in 1917. Borochov’s vision was that Jews and Arabs would form a working class in Palestine and would be united in the struggle for a socialist state which would inevitably reflect their class interest. [There was a significant current of secular socialist Jewry in the Russian Empire, notably the General Jewish Labour Bund (in its preferred Yiddish title, Algemeyner Yidisher Arbeter Bund), formed in 1897, which resolutely opposed Zionism.] Nonetheless, many Jews emigrated to Palestine to escape pogroms and persecution in the early twentieth century before the formation of the state of Israel. These early Jewish settlers, the Yishuv, sometimes, although by no means always, co-existed relatively peacefully with the indigenous Arab population. However, this leftist secular Zionism is not the whole story. Zionism in its early days also contained a right wing extreme nationalist current. The leader of this strain was Ze’ev Jabotinsky whose organisation, Betar, a youth movement, was formed in 1923 His ‘adult’ organisation, Hatzohar, formed in 1925, was right wing enough to initially support Mussolini. Jabotinsky advocated ‘territorial maximalism’ in Palestine. Such a policy sought Arab defeat and dispossession, rejecting any notion of peaceful co-existence. This ideology is now the dominant one in Israel today and is expressed by Likud, the political party headed by the Israeli Prime Minister, Binyamin Netanyahu. Likud’s predecessor, Herut, was formed in 1948 by Menachem Begin shortly after Israeli independence. Thus, in short, the Zionist movement was fractured from its early days and remains so until the present time. The Poale Zion movement also split into left and right factions; the former represented by Mapai and later the Israeli labour Party and the latter represented by Mapam (later Meretz). Mapai and Mapam dominated the Knesset (the Israeli parliament) in the early years of statehood. The purpose of this narrative about the origins and evolution of Zionism is to counter the widely held belief that it was a monolithic movement with a settled ideology. The only constant that emerges from the foregoing is that of Zionism as a form of Jewish nationalism which, like almost every nationalist iteration that has emerged in world history, has a left, a right and a ‘moderate/diplomatic’ variant. The latter two variants always seek accommodation with the dominant capitalist status quo. This has certainly happened in Israel where the Jabotinsky ‘revisionist’ (a self-named title) version presenting as right wing nationalist Zionism has been resurrected in the form of Herut and now Likud. These, of course, are not the only oppositional voices among Israelis. Gush Shalom (Peace Bloc) and Shalom Achshav (Peace Now) are long standing proponents of alternative peaceful, non-expansionist policies as are many other Israeli human rights organisations. The growing number of ‘refuseniks’, young women and men who, on moral grounds, reject army call-up, serve as a brave reminder of protest in ‘the belly of the beast’. The assassination of the Labour Prime Minister Yitzhak Rabin by a right wing Jewish extremist, Yigal Amir in 1995 presented a sharp prompt, if one was needed, of the fractured nature of Zionist politics in Israel. The assassination took place very publicly at a rally in Tel Aviv attended by some 100,000 supporters of the peace process. For the right Rabin’s ‘crime’ was that he dared to engage in dialogue with the Palestine Liberation Organisation (PLO); something that Likud has steadfastly refused to do time and again, declaring that this organisation, the PLO, is not a ‘partner for peace’. The assassin, Amir, expressed it succinctly when he said that Rabin wanted to ‘give our country to the Arabs’ - a view apparently shared by Likud. It is only when we refute the monolithic interpretation of Zionist theory and practice that we can approach an understanding of the contested relationship between anti-zionism and antisemitism. Without such a nuanced interpretation we will inevitably fall into the ubiquitous trap of assuming that the narrative of contemporary anti-zionists is correct. This is the narrative which equates an ahistorical and undifferentiated view of Zionism with racism, apartheid and even genocidal fascism. Thus, without seeking to ignore the horrific policies of contemporary right wing Zionism, my argument seeks to differentiate this from other variants. Rather it is an attempt to understand that the form of Jewish nationalism (Zionism) which inspired the Yishuv and later the State of Israel was an understandable reaction to antisemitism and the Holocaust. This does not mean that Jewish settlement was problem free, nor that it was conducted without detriment to the Arab population – far from it as the 1967 Six Day War clearly showed. But even before this, the formation of the State of Israel in 1948 as a Jewish state created and continues to create huge problems for its non-Jewish inhabitants. Although there was a relatively peaceful situation in Israel for the first ten years of existence, Ben-Gurion, nonetheless, always viewed the Arab population within Israel as a potentially destabilising threat. Thus it was (and is) that despite the fact that the Declaration of Independence guarantees juridical, political and social equality to all its citizens, Palestinian Arabs living within Israel have been deprived of much of their land, many of their homes and are generally treated as second class citizens. This situation was greatly exacerbated following the 1967 war when Israel expanded its borders into the West Bank, Gaza, East Jerusalem and the Golan Heights. The Palestine Liberation Organisation, formed in 1964, was and remains an expression of Palestinian dissatisfaction with the expansionist and inegalitarian policies of Israel. Apart from numerous attacks and incursions within Israel, it launched the first Palestinian uprising or Intifada in 1987 and the second in 2000. However, it is not my intention to recount a history of the twists and turns of Israeli expansionist politics, much less to analyse the failed peace process and its place within international statecraft, although we should note here the tragic failure of the Oslo Accords in 1993 and 1995. The only lasting significance of Oslo was the creation of and acceptance by Israel of the Palestinian Authority and, importantly, the PLO’s recognition of the State of Israel. The latter is something which Hamas and Hezbollah have steadfastly refused to do. Rather we must return to the central question posed in this essay; namely the contested relationship between anti-zionism and antisemitism. Whilst attempting a non-monolithic and nuanced interpretation of Zionism, I have not sought to exonerate either its moderate or its right wing variants. In fact, some might wonder whether the foregoing critique of Zionist practice by successive Israeli governments, renders the central question I have not yet answered, redundant. So far it would seem that opposing the Zionist project is entirely justified and thus certainly not anti-semitic. In 1975 United Nations resolution 3379 denounced Zionism as ‘a form of racism and racial discrimination’. This resolution was revoked in 1991. Nonetheless, as mentioned earlier, many critics still espouse the UN resolution 3379 and go even further than that. However, this is where I part company with such critics who stubbornly fail to distinguish the historical evolution of Zionist ideology from the more unacceptable aspects of its lived form. In short, anti-zionism is not the same as critical Zionism or even non-Zionism. As a form of nationalism, Zionism, like all forms of nationalism, bears responsibility for the intolerant treatment meted out to those who it excludes from its national/ethnic definition even if they are the original inhabitants of the country in which incomers seek to settle. This is apparent when we look at the white settlement of what is now the US; accomplished as it was by the displacement of native Americans and the enslavement of Black Americans followed by the subsequent racist atrocities committed against them. A similar pattern can be discerned in the case of the settlement of the white commonwealth where Maoris and Aborigines, the indigenous populations of New Zealand and Australia were displaced by force. No-one today argues that despite the crimes committed against their native populations, the countries now called the US, Australia and New Zealand should cease to exist. In this sense Israel is once again singled out for special treatment as we shall see. There are many historic and current examples of such nationalist/nation building malpractice. Witness the effects of nationalist rhetoric when the nationalist ‘cause’ is invoked against migrant incomers. And this is to say nothing of imperialism and neo-colonialism - all carried out waving the national flag and spuriously defending and protecting the so-called national interest of the conqueror. Such imperialism created countries artificially in the material interests of the conquerors. This was especially true in the Middle East and Africa where boundaries between states were often drawn with a ruler on a map and with no regard to the indigenous peoples. Of course, this is not the only way in which nationalism manifested itself. The demand after World War 1 for the right of nations to self-determination was enshrined in the Versailles Settlement in an attempt to dismember the Austro-Hungarian Empire, the Ottoman Empire and German Reich. (The Treaty of Brest Litovsk had already dealt a blow to the former Russian Empire). Jewish nationalism or Zionism can be seen in this historical context of self-determination. It is also the case that hitherto conquered peoples in countries colonised by European imperialists formed National Liberation movements in order to rebel against their colonial masters and free their countries from white rule. By the mid-twentieth century many of these liberation movements had been successful politically, although not necessarily economically as neo-colonialism spread its tentacles over Africa and Asia. Within Israel the PLO must be viewed as a similar liberation struggle intent on creating a Palestinian state alongside Israel - a two state solution which left wing Zionists and progressive Jews in the diaspora are anxious to champion. This is in sharp contrast to the PLO’s main rival Hamas. The Covenant of Hamas calls for the destruction of Israel (in the preamble). It calls for the creation of a Moslem state ‘over every inch of Palestine’ (article 6). Article 13 rejects outright any possibility of a negotiated peace asserting that no solution to the Zionist problem is possible except by Jihad. Furthermore, the Covenant is explicitly anti-semitic espousing overtly a version of the (forged and profoundly anti-semitic diatribe), Protocols of the Elders of Zion (article 22). Now we are approaching an answer to the original question. Hamas has, by implication, answered it for us. For Hamas, as for many of today’s anti-zionists, their objection is not merely to a version of Zionism, it is much more fundamental. They are opposed to the creation and continued existence of the State of Israel. They call into question the legitimacy of Israel as a colonising-settler state. For them a ‘one state solution’ as advocated by Hamas would mean, if not ridding Palestine of the Jews, then at the very least, abolishing any notion of a Jewish state. Western adherents to this position, whether or not they support the Hamas Covenant in full (and hopefully most would presumably baulk at giving credence to the Protocols of the Elders of Zion), seek to justify their anti-zionist stance by a blanket depiction of Zionism and Israel as a racist, apartheid or fascist state. Such a policy ignores Likud’s own move to an alternative one-state solution, a political transition recently exposed, surprisingly enough, by former prime minister, Ehud Barak at Herzliya (June 2016) who warned that Netanyahu’s agenda was in essence the creation of a Jewish state not just in Israel, as at present, but over all of the occupied territories. Thus the stance of western anti-zionists not only fails to counter the danger of the extreme right in Israel, but also refuses to distinguish Israeli state policy from the people inhabiting Israel many of whom, Zionists included, are implacably opposed to the government and its settlement policy. This failure to make a distinction between government and people leads such anti-zionists in a blinkered and almost despairing fashion to a similar direction to that of Hamas; that is, opposition to the continued existence of the Israeli State. This is the inevitable conclusion they must draw from their questioning of the fundamental legitimacy of the existence of Israel. Hence this is the point at which anti-zionism very definitely is in danger of morphing into antisemitism. 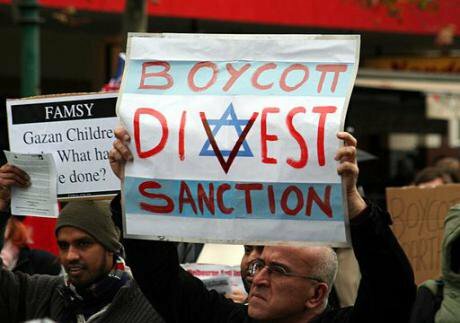 It has led to campaigns to demonise and isolate Israel as a pariah state incorporating such demands as an academic boycott of Israeli universities and to the more general call for boycott, disinvestment and sanctions (BDS). The latter demand, BDS, is in itself not anti-semitic, although considering that it is a global campaign directed solely against Israel, one is forced to question why the other many countries with utterly appalling human rights records are not singled out for similar treatment. It would, in the case of Israel, have been strategically more appropriate to have targeted the BDS campaign to institutions and goods situated or produced in the occupied territories. In addition BDS should concentrate on prioritising the boycott of weaponry imported to Israel and all other materials used to maintain or construct walls, barriers and guard posts to separate and prevent the free movement of Palestinians living in the illegally occupied territories. Conversely, the call for an academic boycott of (only) Israeli universities can definitely be construed as anti-semitic. It fails to distinguish between civil society and the state and in so doing it is thus boycotting only Jewish academics. This is a very misguided strategy given that many (certainly not all) Israeli academics are opponents of the occupation. In the case of the academic boycott, Ariel University, built on the West Bank should have been the sole and legitimate focus of the boycott campaign. However, whatever our attitude to Zionism, it is now of paramount importance to support the demand for a Palestinian state alongside that of Israel. This demands negotiating a peace settlement with the PLO, dismantling the Wall, withdrawing from the Occupied Territories and ensuring that Arabs living within Israel are treated equally politically and economically. There is much else besides, but it must be the case that in order to win a viable two state solution alliances will have to be made with Israeli citizens who agree with this perspective. Without this there can be no political base for a two state solution on the terms set by the PLO. And currently, it must be stressed, the base for such an alliance appears to be emerging. The last election saw a very close result. The Zionist Union, note the name, ran on a peace programme against Likud and came second. A range of other peace parties also did well and Likud only managed to form a government with great difficulty. It is this extreme right wing Israeli government that must be overthrown and those countries who back it exposed. The possibility of achieving this will be assisted if we jettison the kind of anti-zionism, as outlined in the foregoing, which rejects the people of Israel and also, as a consequence, a two-state solution.